Capt James B. Taylor (P) - Trained with his crew as 1st Pilot in the USA. Assigned to 358th BS at Molesworth on 14 December 1943. Assigned as CoPilot with the 358th BS 1Lt Walter A. Kyse crew on 31 December 1943 to gain combat experience when Lt Kyse had been upgraded from CoPilot to Pilot. Flew on eight credited missions as CoPilot with the Lt Kyse Crew (94, 97, 98, 99, 100, 101, 102, 103). 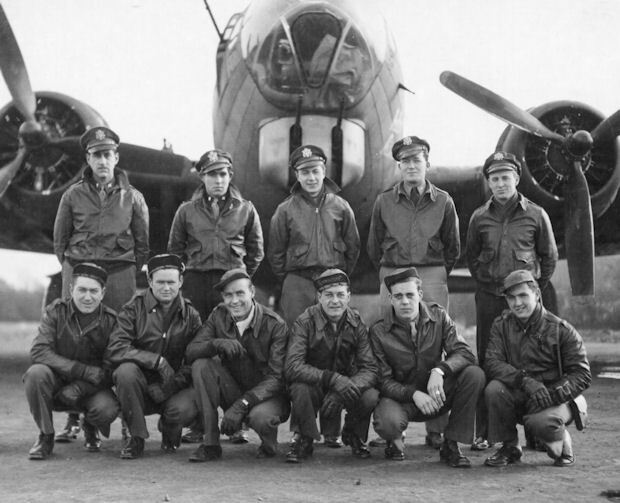 2Lt Taylor resumed his position as a 1st Pilot following the completion of 1Lt Kyse's combat tour on 3 February 1944 and flew fourteen credited missions as 1st Pilot with his original CoPilot 2Lt Charles M. Hall and crew (104, 106, 109, 110, 112, 113, 114, 116, 117, 119, 120, 126, 129, 130). Also dispatched on two non-credit aborted missions (108, 115). 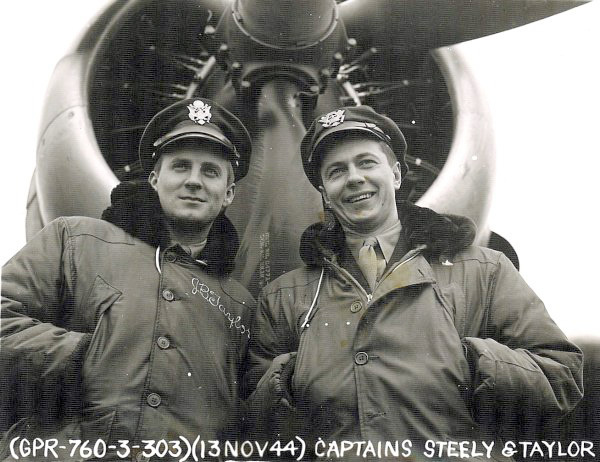 Flew two additional 1st Pilot missions with substitute CoPilots when Lt Hall was upgraded from CoPilot to Pilot (135, 139). Five of his missions were flown as a Squadron Lead Crew Pilot (126, 129, 130, 135, 139). Was promoted to Captain on 8 May 1944 and flew two missions (154, 158) as a Group Lead Crew CoPilot with Capt George T. Mackin as Pilot and Air Commander. Final mission (176), that completed Capt Taylor's combat tour was flown as CoPilot with the 1Lt John H. Cook crew. Was assigned as the 358th Assistant Operations Officer and became the 360th BS Operations Officer on 05 August 1944 and as the 303rd BG(H) Assistant Group Operations Officer on 19 September 1944. Returned to the USA on 22 November 1944. Following WWII was a United Airlines Pilot for 36 1/2 years and as Flight Manager in San Francisco for an additional 8 years. 1Lt Austin J. Mack (B) and S/Sgt Leslie H. Schweinebraten (LWG) - Were Killed in Action on mission #159 on 24 May 1944 when their B-17, with 1Lt Joe R. Worthley as Pilot, ditched in the North Sea.